Of all the globe-spanning coffee brands out there, you are unlikely to come across one as unique as Four Letter Word. Started by a trio that met in Chicago, the coffee company began life as a roastery on an island off the coast of Turkey, where one of the owners was from. A few years later, they decided to open a roastery back in the States, and the Second City was just the right fit. Now, in 2018, Four Letter Word is ready to open their first retail location in Chicago. The space itself is small, only 500 square feet, but is massive compared to their roughly 150-square-foot Turkish location (featured here in the Build-Outs of Summer four years ago). Tiny though it may be, the new 4LW is one of the most beautiful cafes we’ve seen this year on the Build-Outs of Summer. So let’s pop in and say Merhaba! 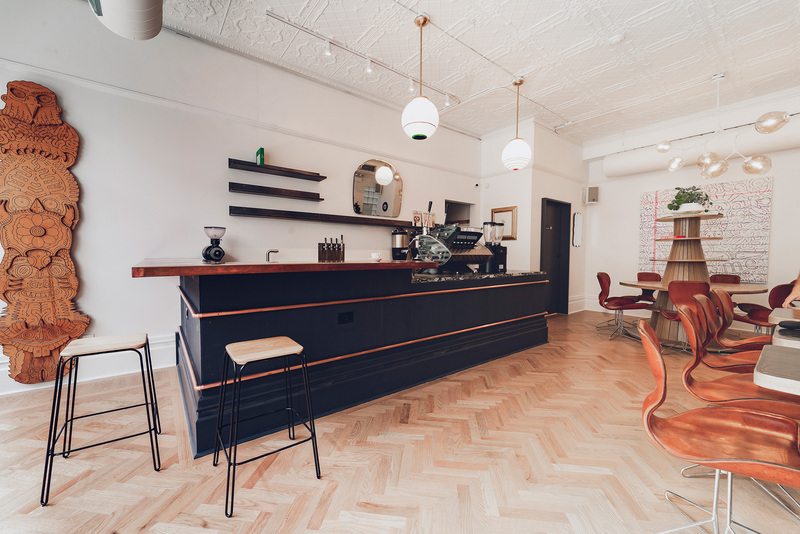 to the brand new retail location of Four Letter Word in Chicago, Illinois. As told to Sprudge by Ria Neri. Four Letter Word started in 2014 in Burgaz Island off the coast of Istanbul, Turkey, founded by Ria Neri, Kevin Heisner, and Eylem Ozkaya. We met in Chicago and have been friends for 22+ years. Fast forward to 2016, we decided to spread the love and open a roasting space in Chicago, in a building called The Plant, a really smart space that houses a collaborative community of food businesses focusing on material reuse and closed loop systems. Fast forward to 2018, the time felt right and ripe for a retail shop, finally! Yay! It’s small but cozy, around 500 square feet. We were able to squeeze in seating for approximately 20 people, plus three standing tables, ideal for a quick shot of espresso. It’s definitely a space with a very personal touch; Eylem, Kevin, and I have items that came from our own homes: books, objects, art, and furniture. One of the best parts about our space: we are right across the street from our friends!! Cellar Door Provisions—an amazing daytime cafe and night time bistro—will be providing us with pastries and Diversey Wine—a natural wine shop (who knows, maybe our shop can host a BYONW* from across the street someday?) We are not opposed. We ask the questions: Where did the coffee originate, what’s the variety, what was the process? Most importantly, what did the producer intend for this coffee to be? We respect the role of the producer. Our job as roasters is to not alter the inherent qualities of the coffee, but to translate them to the best of our ability. What’s your target opening day? Hopefully soon! Targeting the end of August. Yes!! We are so excited to finally serve our stash of 2015 Gesha Village 1931. We travelled to Gesha Village in 2015 and got to cup this first harvest! Bought it, froze it (ala George Howell) and three years later, voila! Also we have a juicy SL-28 Lactic from La Palma Y El Tucan from Colombia and several new lots of Long Miles Coffee from Burundi. Yum. Kevin Heisner, our partner designed the space as well as provided the art for our walls. Four Letter Word is located at 3022 W. Diversey, Chicago. Visit their official website and follow them on Facebook, Twitter, and Instagram.